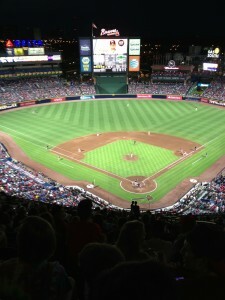 I like to go to a local baseball game during Bridge Nationals, whenever possible, so Steve and I went to Turner Field on Friday to watch Braves play the Marlins. During the last Atlanta Nationals in 2005, Brian and I went to a Braves game, as well. It was so hot and humid that day – 102 degrees in the shade and the city did not cool down during the evening. The most memorable moment of that trip was when the Braves fans were doing the signature tomahawk chop chant and in the lights of the stadium, I saw the sweat flying off of people’s forearms in big sweaty arches. It was beyond disgusting. Luckily, this time it was a bearable 90 degrees, a lovely night for a ball game. Waffle House opened at Turner Field on July 26th and on that night the Braves started a winning streak that was up to 13 games the night we were there. Clearly, there is something magical about Waffle House. I got the infamous “all the way” home fries ($9) and a classic waffle (Sorry Jeff, they only offer classic, peanut butter or chocolate chip). 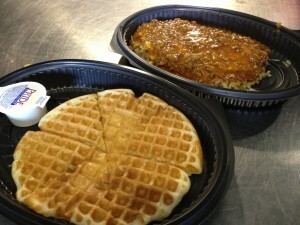 The waffle ($5.75) was floppy and bland. I’m sure pecans would have at least added some crunch. The “all the way” home fries were scary – it was shredded potatoes covered in a pool of onions, cheese, ham, jalapeños, mushrooms, tomatoes and chili. However, they were pretty tasty; the kind of food you can only justify eating in a ball park. The Braves won that night, with 3 home runs, but sadly that was the end of it – they lost the very next night.